I reviewed the first two issues of the Salvagers comic, some months ago, and was very impressed with the story, characters, and artwork. Needless to say that I couldn't wait to get my hands on issue number three to see how the storyline developed. Fortunately for me, the third issue of the Salvagers was recently released, and I was able to get my hands on a copy. Fortunately for you, I am going to provide you with a review of the issue. 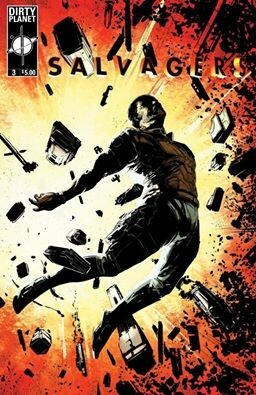 To bring you up to speed (in case you missed my last Salvagers review), the Salvagers series is set in the distant future, where habitable planets are connected through intergalactic trade. Systems with larger trade corporations are thriving, while planets with little shipping resources turn to piracy and small guerilla military units to pillage trade ships. This forces the larger trade companies to hire private security contractors for protection. With clashes between pirates, private security forces, and the military, along with the occassional, unpredictable natural space phenomena, outerspace has become a very violent place. Incapacitated ships, or "WRECKS", sometimes carrying precious cargo, are often left abondoned, in the wake of this violence. Salvagers are licensed crews what are commissioned by governments, empires, and corporations to remove the wrecks. When we last left the Salvagers crew, they had taken on a high-risk job of salvaging a wrecked Darzinean Warspray space vessel in deep space, in order to help crew mate Brigby pay off the huge debt that he owed the Dorak Crime Family. While aboard the Warspray, the crew was greeted by security droids and a hostile environment. During the course of events, the crew has become separated, with each group facing its own set of unique challenges as they all try to avoid peril at every turn. My only real gripe related to the first two issues, was that there was not a good transition from the first issue to the second. That problem was remedied in the third issue, as the first page features a great story recap, which leads readers seamlessly into the current issue. The tension, from the first two issues, not only carries over into this issue, but is elevated to new levels. The crew's challenges prove the adage, that adversity builds character, as readers are given more insight into each character's personality and interpersonal relationships with each unfolding event. You can easily become emotionally attached to any, or all, of the characters, and you will have a vested interest in whether, or not, they make it out of their current predicament alive. This is quite a feat of story-telling by Bob Salley, as this level of character focus and development is not always evident in comic books. As expected, the exceptional artwork from the first two issues, not only carries over to the third, but exceeds the previous issues in overall visual quality. The visuals provided by artist George Acevedo, colorist DeSika, and letterer HdE pulls readers in, sets the perfect visual tone for the story, and brings a strong emphasis to key scenes, which helps drive the tension and excitement associated with the scenes. The visuals are a perfectly complement to the story, and as the story has shown gradual improvement with each issue, so has the quality of the artwork. I can't wait to see what issue four and subsequent issues will look like. Salvagers: Abandoned Cargo Part 3 is another strong installment in the series, and well worth the purchasing price. As I mentioned in my previous review, this is a really good series, with the potential to be epic. I do not exaggerate when I say that I can see this story depicted on the big screen. Don't miss your opportunity to get onboard early.